Wow, this was the longest time I've ever gone without blogging. It was very interesting being (reasonably) unplugged. I was even more unplugged this time than last year when we spent Christmas in South Africa (where I was blogging near-daily over a cell phone modem). Anyway, I'm still on vacation until next Monday, but I have been messing around with a few things I wanted to share, and here is one such project. Disclaimer: I'm not on the Windows 7 team and I have no knowledge about anything they are, have, may, may not, will, will not do, or did and didn't tell anyone. I'm just a dude who likes Windows. However, the one remaining gaping hole in Windows 7 for the Power User (like me with my four (sometimes five) monitors) is the lack of a native taskbar that works across more than one monitor. I'm sure someone owns this feature on Windows 7 and I'm sure that it didn't make it into the product for some reason and I'm sure someone is looking at the feature for the future*. Regardless, Windows 7 has an awesome ecosystem of 3rd party stuff and there are two contenders fighting for the title of "Multi-Monitor Taskbar for Windows 7." The most interesting thing about Windows 7 isn't a feature; it's that Windows 7 has a strong sense of aesthetic. Nasty looking apps won't cut it any more. Folks want things to integrate with Windows 7 features like jump lists and the superbar. They want clean design and fresh styles. Most of all, they want their apps to LOOK like Windows 7 - like they belong. Now, back to the taskbar thing. Here are the two contenders and my conclusion. I'm reviewing these products taskbar capabilities, not the many other features they each offer like multi-monitor wallpaper support, etc. For the most part they are similar, but I'm a utilitarian and I'm interested in the bread and butter stuff first. First, Ultramon, then DisplayFusion. Note the post was written against Specific Versions whose features are in likely flux. Try them both yourself! Realtime Soft appears to be a one-person company run by Christian Studer out of Switzerland. He's been making software since 1998 and I purchased his product Ultramon when it was version 2 in Jun of 2002. Wow. That's over 7 years for the math-challenged. Ultramon has long been the only game in town when it comes to multimonitor support on Windows. It gets revised in fits and starts. Sometimes you won't hear anything for literally months, then there will be a flurry of activity, then silence. Christian is very kind when he answers forum posts, but it's no uncommon to hear folks complaining about the speed at which the beta version's bugs are fixed. These days folks want to see code rev'ing weekly, minimum. That said, Ultramon has always been very tight code and I've had minimal trouble with it. As of Dec 21st, there's a 3.0.8 beta available that runs on Windows 2000, XP, Vista and Windows 7. Here are the things I look for in a Multimonitor Taskbar on Windows 7 and how Ultramon 3.0.8 beta stacks up. Here are four apps running in an Ultramon toolbar on my third monitor. Here are the same four apps running in the Windows 7 taskbar on my primary monitor. What's this? Three apps? Well, note that the second and third above were actually Windows Explorer windows. Ultramon not only didn't group them together (per my settings within Windows itself), it also used the actual icons for the folders I was on, rather than the default Explorer one. I think respecting the grouping option is more important then the icon thing, but I though it was interesting nonetheless. It's a pretty darn good facsimile. Sadly, this is where Ultramon falls down. There's no Aero Preview. Recall that Aero Preview is when you get a nice tiny window preview as you mouse over running tasks. In this version of Ultramon you'll just get a sad little tooltip. True, this isn't really functionally necessary, but it's a missing piece that Windows itself does have and as I said before, I want Windows 7 utilities to look like Windows 7. While a small thing, it's enough to give me pause when deciding to use Ultramon. I really like my aero effects. Note that the tooltip unfortunately (and constantly) pops up while you're tracking, basically ruining the effect and getting in the way. Also, very subtle, the color tracking effect "jumps" from button to button as you move the mouse. It doesn't "fade out" as it does on the actual Windows taskbar. It's maybe a 100-200ms animation, but I noticed. Finally, and this may be something that's either not possible or certainly not easy to fix. When you minimize a window on another monitor, the "I'm minimizing" animation is the same one that Windows itself uses, meaning, the app will appear to minimize in a diagonal slashing motion to the primary monitor. This is a bummer, but I suspect tough to fix. When you're using the actual Taskbar in Windows 7, you can rearrange the buttons (tasks, programs) just by dragging them. This is true whether the apps are running or not. You can't rearrange the running tasks on the Ultramon taskbars by dragging, or at all. Ultramon also dynamically adds (as an overlay, but you don't know that) buttons to every window with the same functionality. Note the two extra buttons on the left. It's a very nice touch and Ultramon tries very hard to make these buttons the right size and style as if they were included with Windows. There are some odd windows that paint their own title bar and buttons that will look weird when Ultramon puts these buttons on them. Skype and Office Communicator come to mind. You can add these as exceptions in the config for Ultramon. One other thing of note with Ultramon as a taskbar for other monitors is that this is a taskbar, not a superbar (or whatever the Windows taskbar is called) which means you can't pin icons or make launch-able non-running icons. You also (and this is sad) don't get that apps JumpLists. You can only access jumplists on the primary monitor and even then, only if that app is pinned. Non-pinned apps that are running may have jumplists, but you can't get to them if the app is running on the other monitor. Subtle, but very important, and missed. Ultramon is US$39.95 with a sliding scale for bulk licenses that bottoms out at $19.95 in packs of over 100. You can read the release notes for 3.0.8 to see what's new and what's changing. DisplayFusion is the new kid on the block but it's rev'ing fast and has been really blowing some minds as Ultramon appears to rev slower and be less risky with features and eye candy. Again, DisplayFusion is pixel perfect against the primary taskbar and identical to Ultramon's. They also ignore the grouping options and show Windows separately. Instead of fading in while simultaneously moving up from the bottom, these previews snap in and wipe up. It's close, but it's not perfect. It's maybe 50% there on the intro animation. One awesome thing though, is that these previews are the true live preview that you're using to seeing with Alt-Tab or on the standard taskbar. That means if you're watching a video, you'll see a tiny thumbnail of that same video appearing in the DisplayFusion version of Aero Preview. While the preview intro animation isn't perfect, the animation when you've already got a preview up and you're moving laterally to another one (the preview transition animation, I'll call it) is darn near perfect. I was impressed. Kudos to them for making the effort. I hope they keep trying to get the animation pixel perfect. It matters. Shift-Clicking on a running item doesn't bring up a new instance like it does on the Windows taskbar. Ctrl-Shift-Click doesn't work either. It should run a new instance as Administrator. DisplayFusion also adds buttons to the title bar at runtime, although the buttons are more squared off than the Ultramon ones. Ultramon includes two buttons, but DisplayFusion actually has a menu that lets you add many buttons with lots of different options. You can control what buttons do and in what order they appear. I just find the DisplayFusion buttons to be visually jarring. They do offer various themes for the added buttons, but I'd prefer they just pick up the ambient look and feel. Right-clicking on a running item in DisplayFusion shows only the default System Menu, with no additional menu items. There are no jumplists either. DisplayFusion also allows you to the rearrange the order of running items in their taskbars. There is no smooth dragging like the standard taskbar, but it's an effort that's completely missing from Ultramon. DisplayFusion is US$25. You can read the Change Log to see what's coming in the next version. It's a tight race. I like that DisplayFusion has animations and looks great. But I love the Move To Monitor popup window and System Menu additions by Ultramon. I've used Ultramon for literally years and I trust it. I know it's fast and I've used it for days without crashing. However, DisplayFusion is closing fast. If they continue to focus on getting the look and feel perfect and adding a few options like "Move to Monitor...", DisplayFusion just may be the Multi-Monitor Toolbar for Windows 7. For now, I'll keep switching between both products until one nails it. I encourage you to download and trial both. * Because that's how things work at Microsoft. Believe me, for everything you wish we did, someone on the inside has fought for that feature at some point, and very likely continues to. One thing you have neglected to mention is the screensaver functionality in UltraMon that will allow you to run nearly any screensaver in multi-monitor mode. This can be especially handy for non-multi mon aware screensavers. There's also the wallpaper functionality in both, although I'm personally less concerned with that as I barely see my desktop since I usually have multiple full screen apps open (VS 2k8, VS 2k10, SQL Mgmt, Outlook, etc). It would be great if MS exposed an API to generate the Aero previews. Otherwise, a lot of skilled developers are gonna be writing code to mimic the very same thing. The Aero preview has a public API, and that's what DisplayFusion is using. There's a "move to next monitor" function in FreeSnap (Win+Numpad5). You could then use Display Fusion and still have the "Next Monitor" function. IMO, the number one missing feature in Windows for power users is virtual desktops. Windows is the only modern operating system that does not ship with this feature. Sloppy focus (the accessibility sloppy focus feature does not really work that great) and copy on select are two other things that I would like to see. One thing I like about ultramon is the ability to install it on all my machines using the same license (I exclusively use my machines), where as displayfusion requires one license per machine. Thanks, for reviewing both of these. I've known about, and used, Ultramon for quite awhile now and didn't realize there was anyone else out there worth taking a look at. The things that I've been missing from ultramon are exactly the ones you pointed out. Looks like I'll check out DisplayFusion to see how that works. Ah, thanks for the reminder about dynamic icon overlays. It was on my list but I forgot to write it up. As you can guess, neither taskbar supports dynamic progress or icon creation. Another subtle bummer. you missed one huge thing. display fusion registration is free for life. I've been using Ultramon for about a year. I'd never had a multi-screen setup until then. I use it on both XP and Win7, though, and I love it on both. Do either of these products make the Snap feature work against the edges between monitors? That's a feature I'd pay a license fee for. DisplayFusion looks awesome and it has 50% discount until january 5th!!! A friend of a friend of a friend of a... told me once that they explicitely remove taskbar extending into multiple monitors to keep a central monitor as a "hub" or something ill-defined. All core work happens in this hub monitor, and therefore all access to all applications should be on it, and no other screens. It centralizes access, if you will. I'm sure a similar (or perhaps completely opposite) comment can be found somewhere on MSDN to actually explain the behaviour, but this is what rumor has told me. How about http://www.mediachance.com/free/multimon.htm? It's free..
Don't forget windowbutton-arrows that makes the window go left, right, maximize and minimize. In a multi monitor environment (which every developer should have) windowbutton-shift-right/left sends the windows between the monitors. My personal recommendation is Actual Multiple Monitors. It is a most powerful utility among others and it works fine under Windows 7. The most important feature for me is an additional taskbar on my second monitor that has all features of main taskbar like Start button and tray area with notification icons. 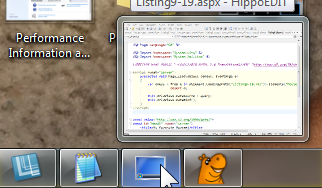 Even more, it has Pin to Taskbar feature of Windows 7. I Agree with Michael give Actual Multiple Monitors a go or the full suite of that companies products Actual Window Manager the advantage with this one is you get a start menu button and the tray on your additional monitors. You can also set programs to open on whatever monitor your mouse is on along with loads of other settings. Actual Multiple Monitors really rocks! I cannot imagine my work without this amazing software! It saves me A LOT of time. BTW, don't forget to check this review. I'll have to go with Task Se7en. Although, its still beta and not very well known it has almost all of Windows 7 new features: Aero peek, overlay icons, progress notification on taskbar buttons as well as minimize and restore animations.